1971   Protetch-Rivkin Gallery, Washington, D.C.
1979   Museum for (Sub) Kultur, Berlin, West Germany, The International Strike of Artists? 1979   Kunstverein, Hamburg, West Germany, The Artist: Hermit? Investigator? Social Worker? Frames for Life: The Public Organization of Private Experience. 1990. Panel Discussions, Dia Center for the Arts, N.Y.C. April-May 1991. Public Space in a Private Time. 1990, in: Critical Inquiry, Vol. 1614. 1990. Performance After The Fact, 1989, in: DOCUMENTS, No. 0, Paris, 1992. Projections of Home. 1988, in: Artforum, Vol. XXVI. March 1988. A Possible Model for Fairy Tales. 1986, in: New Observations Nr. 45. 1987. Playing With The World "Doll", 1986, in: THE DOLL SHOW, Hillwood Art Gallery, C. W. Post College, Greenvale, New York. Coming Out (Notes on Public Art). 1987. Some Notes on a Show Called Visions of Paradise. 1984. Television, Furniture & Sculpture: The Room with the American View. 1984. Normal Art. Art in Public Places. A course at the San Francisco Art Institute. 1983. Lecture in: Site: The Meaning of Place in Art and Architecture, in: Design Quaterly. Summer 1983. Some Grounds for Art as a Political Model. 1981. Vehicle / Architecture / Propagando. 1981. Notes in: Situation Esthetics: Impermanent Art and the Seventies Audience, in: Artforum. January 1980. Steps into Performance (and out), in: A. A. Bronson & R Gale, Performance by Artists. Toronto 1979. Some Notes on Video as a Base, in: D. Davis & A. Simmons, The New Television: A Public / Private Art. Cambridge 1978. Some Notes on Documenta 6 and My Place Inside and Out of it, in: Parachute. Autumn 1977. Ten Point Plan for Video, in: I. Schneider & B. Korot, Video Art: An Anthology. New York 1976. Notes on Drawing, in: Kunstforum, 1975. West, He Said (Notes on Framing). 1975. Notebook: On Activity and Performance, in: Art and Artists. May 1971. Levine, Ed, In Pursuit of Acconci, Artforum, April 1977. The Power of the City1The City of Power. Whitney Museum of American Art, Downtown at Federal Reserve Plaza, New York, 1992. 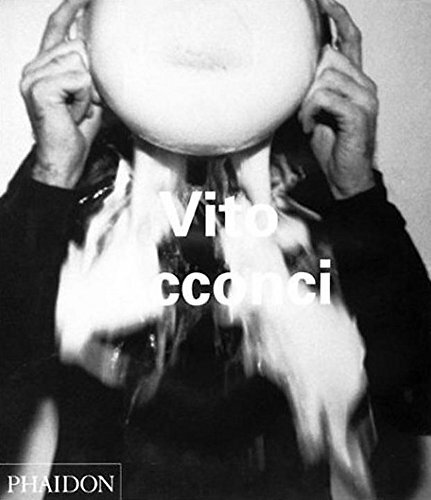 Vito Acconci. Museo dArte Contemporanea, Prato, Italy, 1991. Power: Its Myths, Icons, and Structures in American Art, 1967-1997. Indianapolis Museum of Art, Indianapolis, 1991. Word as Image: American Art 1960 - 1990. Milwaukee Museum of Art, Milwaukee, 1990. Contemporary Art From New York - The Collection of the Chase Manhattan Bank. Yokohama Museum of Art, Yokohama, Japan, 1989. Image World: Art and Media Culture. Whitney Museum of American Art, New York, 1989. Vito Acconci: Public Places. Museum of Modern Art, New York, 1988. Vito Acconci Photographic Works: 1969- 1970. Brooke Alexander Gallery, New York, 1988. Vito Acconci: Domestic Trappings. La Jolla Museum of Contemporary Art, La Jolla, California, 1987. Wienfluß, The Vienna Festival. Vienna', Austria, 1986. Public and Private: American Prints Today. Brooklyn Museum, New York, 1986. Real Time-Actual Space. La Jolla Museum of Contemporary Art, La Jolla, California, 1986. Vito Acconci: The House and Furnishings as Social Metaphor. USF Art Galleries, University of South Florida, Tampa, 1986. A New Beginning, 1968-1978. The Hudson River Museum, Yonkers, New York, 1985. Vito Acconci / IMATRIX 87. Wadsworth Atheneum, Hartford, Connecticut, 1985. The Doll Show: Artists' Dolls and Figurines. Hillwood Art Gallery, C. W. Post Campus, Long Island University, Greenvale, New York, 1985. Furniture and Furnishings: Subject and Object. Museum of Art, Rhode Island School of Design, Providence,1984. Visions of Paradise: Installations by Vito Acconci, David Ireland, and James Surls. Hayden Gallery, Massachusetts Institute of Technology, Cambridge, 1984. Het Lumineuze Beeld / The Luminous Image. Stedelijk Museum, Amsterdam, 1984. Content: A Contemporary Focus, 1974-1984. Hirshhorn Museum and Sculpture Garden, Washington, D.C., 1984. Metaphor: New Projects by Contemporary Sculptors. Hirshhorn Museum and Sculpture Garden, Smithsonian Institution, Washington, D.C., 1982. Documenta 7. Kassel, West Germany: D. + V. Paul Dierichs GmbH & Co. KG, 1982. Machineworks: Vito Acconci, Alice Aycock, Dennis Oppenheim. Institute of Contemporary Art, University of Pennsylvania, Philadelphia, 1981. Other Realities- Installations of Performance. Contemporary Art Museum, Houston, 1981. Vito Acconci. Arbeiten in Deutschland, 1979-1987 Vito Acconci: Padiglione Arte Contemporanea. 1981 Workshop in Zürich. KöInischer Kunstverein, Cologne, West Germany, and Kunsthaus Zürich, 1981. Vito Acconci: A Retrospective 1969-1980. Museum of Contemporary Art, Chicago, 1980. VitoAcconci: Headlines and Images. Stedelijk Museum, Amsterdam, 1978. Vito Acconci: Cultural Space Pieces 1974 - 1978. Kunstmuseum Lucerne, 1978. Time. Philadelphia College of Art, 1977. Improbable Furniture, Institute of Contemporary Art, University of Pennsylvania, Philadelphia, 1977.
ldentité / Identifications. Centre dArts Plastiques Contemporains, Bordeaux (France), 1976. Video Art, Institute of Contemporary Art, University of Pennsylvania, Philadelphia, 1975. Bodyworks. Museum of Contemporary Art, Chicago, 1975. Eight Contemporary Artists. The Museum of Modern Art, New York, 1974.